In the Roman world astronomical knowledge was considered only a tool that would produce tangible/practical results and benefits for everyday life. There is little doubt that astronomy played a significant role in many aspects of Roman life.One of the fields of practical application of astronomical knowledge was the measurement of time. One of the best-known manifestations of Roman astronomy is the Julian calendar. Land surveyors, employed all over the empire with simple instruments, needed good astronomical knowledge: this is clear from surviving surveyors' manuals. Other topics instruct the navigators of commercial ships in navigating by the stars. Sundials were in common use for telling the hour of the day: over thirty were recovered in Pompeii alone. During the Roman Empire astronomy did not progress any further than than the knowledge of the Greeks. After Ptolemy (Ptolemaic Kingdom based in ancient Egypt), the end of Hellenistic civilisation also meant the end of Greek astronomy. The merit of Rome was simply that it enabled the dissemination of Greek thought throughout the vast territory of the Empire. A celestial globe is a 3-dimensional map of the stars. A celestial globe shows the apparent position of the stars in the sky. They have been used since classical times and were produced initially by Greek astronomers. The beginning of construction of celestial globes can hardly be earlier than the existence of a spherical theory of the heavens. The Greek philosopher Aristotle (384-322 BCE) proved that the earth was round. Over 100 years later the Greek mathematician Eratosthenes of Cyrene (276-194 BCE) is said to have calculated the circumference of the earth with considerable accuracy. The Greek astronomer Hipparchus of Rhodes constructed the first celestial globe on record, but it is believed other celestial globes had existed before it. (An extensive discussion of Hipparchus' use of a celestial globe appears in Archive for History of Exact Sciences, Volume XXIX, 1984, Pages 201-236; and Volume XL, 1989, Pages 305-354.) The 5th- and 4th- centuries BCE saw the introduction of celestial mapping in Greece - including celestial globes. (The origin of sphere-making is dated by James Evans to the time of Plato (circa 425 BCE - circa 345 BCE) with its wider diffusion being due to the popularity of Aratus' Phaenomena.) The ancient Greek (and later) astronomers drew the constellations on globes both in sky-view and in rear-view - that is, with the observers inside or outside the globe - and sometimes even on the same globe. This was also done with descriptions of the constellations in ancient texts. Allusions to the existence of celestial globes date to the Greek scientists Eudoxus of Cnidos (circa 409-356 BCE) and Archimedes of Syracuse (circa 287-212 BCE). Likely the constellations were represented/depicted by the characters and animals representing them. The early Greek astronomers and philosophers constructed 3-dimensional models; brightly coloured celestial globes, and mechanical representations of the workings of the moving sky. Archimedes of Syracuse (287-212 BCE) also constructed a mechanical planetarium of the known celestial system (which was later much admired by educated Romans). It appears that Eudoxus of Cnidus was the first to draw the constellations on a globe representing the sky seen from the outside looking inwards, rather than as seen by an observer on the earth looking outwards (together with the main celestial circles). The Greek philosopher Anaximander of Miletus (circa first half of the 6th-century BCE) taught that the sky was a globe and possibly invented the celestial globe. It appears the actual term used was 'sphere.' Diogenes Laertius wrote that Anaximander of Miletus had made a sphere. Radim Kocandrle has made the point (2012) that unfortunately, the meaning of the term 'sphere' is not made clear. We do not know whether it was an armillary sphere (model), a celestial globe, or a drawing, or whether the term sphere is only due to an anachronism of later authors. There is simply no certainty that star globes existed before the time of Eudoxus, i.e., existed with Thales of Miletus and Anaximander of Miletus. An important contribution to the knowledge of sphere- making is provided by the Antikythera mechanism, discovered in an ancient shipwreck in 1901. This discovery clarifies not only how mechanics was used in the construction of the spheres, but also some details of the ancient lunar theory, as developed from Hipparchus to Ptolemy. Cicero recorded the tradition that Eudoxus had constructed a star globe that accurately depicted the constellations. (It is thought that Eudoxus was the first Greek to make a comprehensive star map and place it on a globe.) Based on this it is concluded by some persons that Aratus used the star globe of Eudoxus, plus his works (the Mirror, and the Phaenomena) describing/consolidating the constellations, as guides for his poetic description of the positions and appearances of the constellations. The most significant impulse for the representation of celestial figures on a celestial globe came from the astronomical poem Phainomena by Aratus of Soli (circa first half of the 3rd-century BCE). Decorative celestial globes were produced to illustrate and explain the astronomical poem. The purely scientific celestial globes of the ancient Greeks and Romans were mostly constructed of wood. They were constructed with the key celestial circles, a dark blue background to represent the night sky, and the stars were indicated by their apparent brightness and colour. The apparent magnitude of stars was represented by discs of 6 different sizes and their colour by either red or yellow. A marble celestial globe (thought to be Roman), originally in the museum of the German town of Arolsen (now Bad [= Spa], but now owned and displayed in the Württembergisches Landesmuseum Stuttgart, and called the "Stuttgart Celestial Globe.") was discussed by Rudolph Gaedechens (1834-1904, Professor of Classical Archaeology, Jena) in his small book (57 pages) Der marmorne Himmelsglobus des fürstlich Waldeck'schen Antikenkabinettes zu Arolsen (1862). It shows the zodiacal band with a sequence of images of the zodiacal signs. Parts of the Zodiac can still be seen with Pisces, Aries, Taurus, and Gemini being identifiable, as well as the Northern constellations Triangulum, Andromeda, Perseus, and Auriga. The Stuttgart Celestial Globe is discussed in the journal Der Globusfreund, Issues 45-46, 1998. The caption for Figure 5 (Der Globusfreund, Issues 45-46, 1998) showing the globe states: "Celestial globe. Zodiac and Jupiter's attributes (eagle, lightning). Provenance unknown. Marble. Ø 16 cm. Formerly Arolsen collection. Stuttgart Württembergisches Landesmuseum. After GAEDECHENS 1862." See also the brief discussion in: Die Antiken des Fürstlich Waldeckischen Museums zu Arolsen by Rudolph Gaedechens (1862). Basically, the globes are the only visual records of the constellations, to survive from antiquity. No functional celestial globes have survived from amongst the array of late classical artifacts that have come down to us. However, late classical globes were still extant in the early centuries of Islam (and serving as potential models for constellation imagery). This is testified in a report that a metal globe made by Ptolemy himself was on exhibition to the public in Cairo library in 1043CE. Also, Ibn al-Saläh (died l154 CE) stated that he had seen a Greek celestial globe from circa 738 CE. The earliest Islamic celestial globes to survive are both from late 11th-century Valencia, although there were certainly earlier examples from which al-Sūfī (or his artist) may have taken iconographical inspiration. Al-Sufi mentions that he had seen many celestial globes, including ones made by the Harranians. Emilie Savage-Smith wrote (Islamicate Celestial Globes (1985)): "Other artifacts from late antiquity, though not strictly celestial globes, are closely related in design if not in function. These remains include vessels for holding liquids, and zodiacal or astrological globes. Two hollow globes that served as vessels are known, one seen in AD 1888 outside a school building at Larissa, and the other a fragment of a blue marble Roman vessel with stars placed arbitrarily and with constellation figures chiseled out and originally inlaid with another material that has since fallen out. This fragment is especially interesting in that the Milky Way is indicated on it, but the placement of the constellations does not follow completely either Aratus nor Ptolemy. Four globes having only the 12 zodiacal figures decorating them are extant, including a marble one at Arolsen (160mm in diameter), which had an eagle perched on top, and a marble one (600 mm in diameter) at the Vatican, which in addition has a few decorative stars dispersed over it. The marble "astrological" globe from the third century AD found at the Dionysius theater in Athens is not a celestial globe at all, but bears various astrological and divinatory symbols. 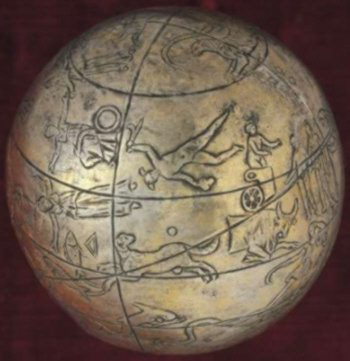 Celestial globes of the Aratean variety can be seen as a rather popular motif in frescos, statues, coins, and other works of art from the Greco-Roman world, in many cases intended probably as an allegorical representation of world or universal power." Elly Dekker (2013) discusses the Larissa globe in considerable detail. 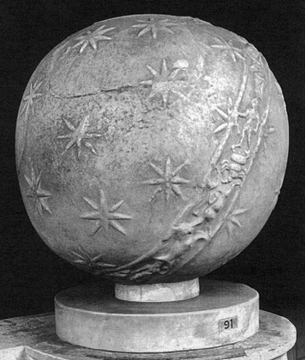 The remains of this (90 cm diameter) bluish marble celestial globe was found in Larissa in Thessaly, Greece by B[?] Sauer in November, 1883. Also discussed by Elly Dekker (2013) is the issues involving a celestial globe that is attributed to Hyginus (Latin author and librarian to the Emperor Augustus). The late André le Boeuffle argued that Gaius Julius Hyginus used a celestial globe when writing parts of his De Astronomia (1st-century CE). For a speculative but interesting article see: Dimitrakoudis, Stavros. et. al. (2006). “Archaic artifacts resembling celestial spheres.” (Mediterranean Archaeology and Archaeometry, Special Issue, Volume 16, Issue 3, Pages 93-99). The Kugel Globe (a miniature globe (suggested to perhaps be part of an armillary sphere?)) is dated circa 300-100 BCE. It may be the earliest celestial globe to survive from Classical antiquity. It is a small globe 6.3 cm in diameter, made of gilt silver, and was acquired and held for some time in the Gallery J. Kugel Antiquaries in Paris (France). It was acquired by this Gallery circa 1996. The Kugel Globe (after the Paris antiquarian, Galarie J. Kugel), which is now in a private collection, was reportedly found alongside 2 objects dating from the 2nd century BCE. The globe was reportedly discovered in eastern Turkey, in the region of Lake Van (formerly part of Armenia). According to Elly Dekker (2013) the Kugel globe is "believed to have been found in the area of Lake Van, the largest lake in Turkey, located in the far east of the country." The globe was first described in: Cuvigny, Hélène. (2002). "Silver Celestial Globe from Antiquity." In: Kugel, A. (Editor). Spheres. The Art of the Celestial Mechanic. (Pages 22-26). The Kugel Globe is thought to have originated as a copy of an older existing sphere that had been repaired. This is because it appears to have reproduced the repair rivets on the original globe in the mistaken belief that they were depictions of celestial details. This would indicate that the artisan who made the copy was not knowledgeable in astronomy. The originator of the globe is unknown. Numerous aspects of the iconography and astronomy suggest a likely Hellenistic date for the globe. However, it does not follow the Graeco-Roman astronomical norms of the period as defined by the astronomer Hipparchus. The size and positions of a number of constellations are misplaced. (Also, Libra is not depicted on the Kugel Globe.) The position of the ties linking the two fish of Pisces is derived from the Catastérismes of Eratosthenes (and this iconographic tradition is also copied in the De Astronomia of Hyginus). The constellation of the Horse has no wings and be either a representation of the horse Helicon or the horse Pegasus (but without the wings). Hélène Cuvigny has suggested that the stylistic discrepancies in the representation of the constellations could mean they have been copied from different sources. Jim Fuchs has suggested that the crudely engraved (pair of) Hunting Dogs were added well after the globe was originally engraved. (If genuinely astral they represent the earliest known depiction of Boötes' dogs.) Also, the usual norm of representing the constellations has been ignored (or perhaps there was no awareness of such). Most of the constellations on the Kugel globe are the mirror image of those seen in the sky. Contrary to Hipparchan tradition, the depiction of the majority of constellations is the same as they would be seen by an observer on earth. The constellation figures (with the exception of Sagittarius) are not depicted from the perspective of an observer positioned outside the celestial sphere looking back towards earth. Consequently, the constellation figures are shown from the front - not from the back as was the usual manner of depiction. According to Elly Dekker, the Kugel globe follows the older Eudoxan tradition in globe-making - the presentation on it of the constellations in images that mirror what we see in the sky. The Mainz celestial globe. (This may be a photograph of a replica of the original globe.) Roman celestial globe, dated 2nd-century CE. (Mainz, Römisch-Germanisches Zentralmuseum, inv. 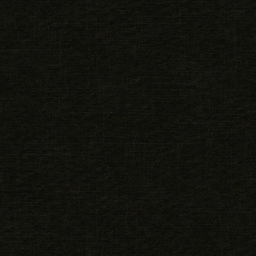 42695D.) The globe shows the 48 Ptolemaic constellations known in the Roman period, plus the circles of the solstices and of the equinoxes. It also has the oldest known representation of the Milky Way. The Mainz Globe (a miniature globe) is dated (by a painstaking analysis of the engraving style) to circa 150-220 CE (the Roman imperial period). It is a small bronze (brass) globe, about 11 cm in diameter, that was acquired in 1996 by the Römisch-Germanischen Zentralmuseum in Mainz (Germany). It is believed by some persons to have originated in Roman Egypt. (This identification of its place of origin is due to the single iconographic peculiarity of Aries reclining in the Zodiac.) According to Elly Dekker (2013) the Mainz globe is believed to have come from western Asia Minor. It is a complete celestial globe in that it depicts all 48 Classical constellations (but does not fully agree with the star-catalogue of Claudius Ptolemy) with relative precision. The majority of the 48 constellations depicted on the Mainz Globe correspond to those described in Ptolemy's Almagest. (Some commentators simply state that the constellations are inaccurately located on the Mainz globe.) The constellations are mostly depicted from the outside (looking toward earth). Some human constellations figures are the reverse and others the mirror images of those seen in the sky. On the Farnese Globe a number of constellations are not depicted and others are damaged. The Mainz Globe is the oldest known (and only known) complete celestial globe found to date from Graeco-Roman antiquity. Though the Mainz Globe is not a scientific work the starry sky and principal celestial circles are quite accurately depicted. There are the lines of the ecliptic, the colures, the equator, and the tropics. The zodiac is also quite accurately depicted. The longitudes of a number of stars (such as Sirius, Aldebaran, and Orion) are incorrect. It originally formed part of a sundial and was positioned on top of the gnomon. The entire Milky Way is quite accurately depicted on the Mainz Globe and this is the first (and only) complete depiction known. The outline of the Milky Way on the Mainz globe exhibits features which appear to follow closely Ptolemy's description. The originator of the globe remains unknown. Part of the value of the Mainz Globe is its value as evidence in confirming ancient references to precise celestial globes. A wooden 13th-century CE Premyslid celestial globe has been kept at Bernkastel-Kues, a town situated on the river Mosel (Moselle) in Germany. Bernkastel is on one bank of the river Mosel and Kues is on the other bank of the river Mosel. The wooden globe is approximately 27cm in diameter and dated to the 2nd half of the 13th-century. The Pfemyslids (Přemyslids) were a Czech royal dynasty (having their origin in the 5th-century CE) that ruled in Bohemia (which they created by uniting other small states) and Moraviar, from 895 CE until 1306 CE (the last male member died in 1306). The Premyslid celestial globe is a very precise astronomical device from 13th-century CE that has connections to the ancient Greek astronomical tradition. The wooden globe is one of the oldest surviving celestial globes from antiquity. Studies of the relevant ancient and medieval texts by the classical philologist Alena Hadravová (Research Center for the History of Sciences and Humanities), with mathematical assistance by the astrophysicist Petr Hadrava (Astronomical Institute, Academy of Sciences of the Czech Republic), of the fragile wooden globe show: "All fourty eight Ptolemaic constellations are marked on this globe with most of the stars from the Ptolemy's star catalogue. The relations between the constellations and their parts as well as positions of the stars within them correspond with the ancient textual tradition known from the works by Aratos, Pseudo-Eratosthenes and Hyginus." The globe was part of a collection of astronomical instruments and manuscripts belonging formerly to Czech Kings from the Premyslid and Luxembourg dynasties (perhaps King Premysl Ottokar II), that was bought in 1444 by Nicolaus Cusanus. (One source mentions the wooden globe was acquired from the royal court in Prague.) The collection consisted of 16 books on astronomy, a wooden celestial globe, a copper celestial globe and various astronomical instruments including an astrolabe. Cardinal Nikolaus Kryffs (Krebs) 1401-1464, Bishop of Brixon, better known as Nicholas Casanus. Casanus, made his purchase in Nuremburg on the occasion of the Imperial Diet there in 1444. 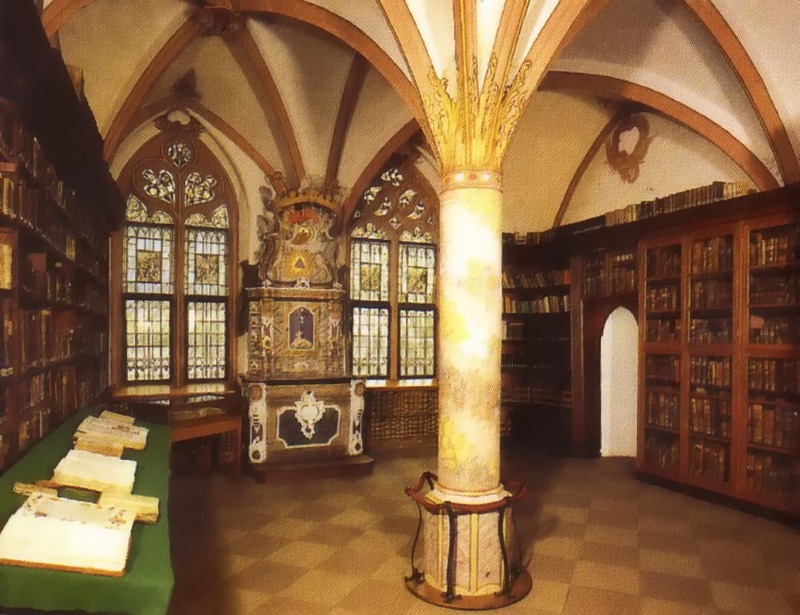 His astronomical instruments have been preserved (kept on display) in the Cusanusstift (the St. Nicholaus Hospital Library (Late Gothic Cloister) founded by Casanus. Cardinal Nicholas Cusanus owned both of the oldest surviving European celestial globes. It is generally thought that both may have been fabricated in Germany. One was made of wood and painted and is dated from the 14th-century. The other was made of metal (copper) and engraved with constellation figures and is dated from the mid 15th-century. It appears the metal (copper) globe was modelled on Arabic globes. The provenience of the wooden globe is unknown (but Prague or Germany are speculated). There is a lack of Arabic influence in the iconography of the wooden globe. Alena Hadravová and Petr Hadrava state: "We assume that the globe is probably connected with the Sicilian court and cultural centre of Friedrich II of Hohenstaufen, known by the direct continuation of the ancient Greek tradition." According to Alena Hadravová and Petr Hadrava: "The Premyslid globe was constructed as the universal precession globe which is described in the Ptolemy's Almagest, i.e., in ecliptical coordinates. According the results of our measurements, the positions of most of stars correspond with those given in Almagest with root-mean-square error of a few tenths of degree, i.e., within about one millimetre. It reveals that the globe was not a mere decoration but remarkably precise instrument." (See the Abstracts for "Ancient Astronomy and its Later Reception," The 5th International Conference of the European Society of History of Science, November 2012.) Unfortunately the exterior of the Premyslid celestial globe is fading with time. Extracts from, Hadravova, Alena. and Hadrava, Petr. (2014). "Reflection of Ancient Greek Tradition in the 13th c. Premyslid Celestial Globe Saved in Bernkastel-Kues." In: Katsiampoura, Gianna. (Editor). Scientific Cosmopolitanism and Local Cultures: Religions, Ideologies, Societies. (Pages 45-50): "In the course of our project, when the translations were basically finished, the globe was borrowed from Cusanusstift in Bernkastel-Kues to an exhibition in Prague, where we had a possibility to investigate it in more details. It appeared immediately, that the drawings of constellations on the globe and their mutual relations are practically the best available illustrations to the ancient textual tradition on this subject. Moreover, the unique construction of the globe as the universal precession globe described in Ptolemy's Almagest (which we shall deal with in our subsequent contribution), together with a lack of Arabic influence in the iconography revealed that the globe represents a valuable remnant of the tradition of ancient Greek mathematical astronomy persisting in Europe till the Middle Ages. The celestial globe of 27 cm in diameter is made of birch wood, covered by fine canvas and plaster into which positions of stars, drawings of constellations and some coordinate circles are engraved. The stars are marked with small holes in the upper layer of the globe. The holes were coloured in red, and the figures in dark brown, which was softened with the white in some places. However, this fact is known to us from the literature only, because nowadays only some traces of the red colour are discernible. ... 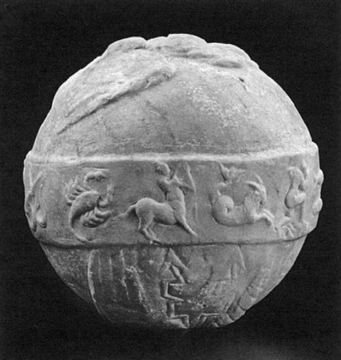 The fact, that the construction of the Premyslid globe as well as its iconography reveals strong ancient Greek influences, which were not mediated by Arabian environment, leads us to a hypothesis, that the globe was made in connection and tradition of the Hohenstaufen Sicilian court at Palermo. 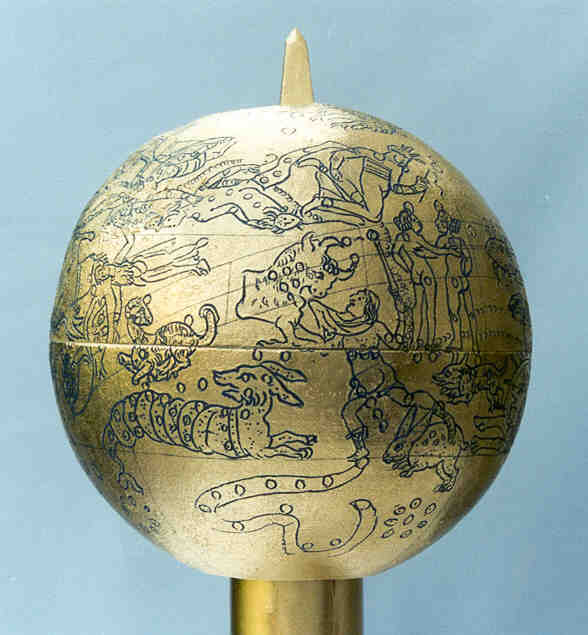 The Premyslid globe features all forty-eight Ptolemaic constellations (northern, ecliptic, and southern ones). The constellation of Scorpius is depicted on the ecliptic in its older variety, i.e. the claws of the Scorpius overlap the space of the previous zodiacal sign, which was later filled by the zodiac constellation of Libra. All the constellations on the globe are drawn by a very nice, elegant black line following the direction of the view from above the sphere of sky. Apart from all the Ptolemaic constellations, the basically complete list of stars from Ptolemy's Star Catalogue is depicted on the globe. The layout and mutual positions of constellations and stars agree with the tradition documented in texts, such as Aratos, known in the Middle Ages thanks to the Cicero's and Germanicus's translations from Greek to Latin, (Pseudo)-Eratosthenes, and Hyginus. When comparing the positions of constellations on the globe to the description in these sources, the astonishing precision of correlations emerges. It is only important to be aware of the side orientation of the constellations in the texts and on the globe. Similarities also prevail when comparing the stars depicted on the globe to their counterparts in Ptolemy’s Catalogue." Note: In 1963, Alois Krchňák claimed that ms. Kues, Hospitalbibliothek 207 showed similarities to the wooden celestial globe also in Kues. Hadravov, A. and Hadrava, P. (2011). "The celestial globe from Bernkastel-Kues" In: K. Beneovsk (Editor). A royal marriage. Elizabeth Premyslid and John of Luxembourg - 1310. (Pages 358-363). (Muzeum hlavnho msta Prahy, Praha. ISBN 978-80-85394-88-7, Czech version 978-80-86990-55-2). Hadravov, A. and Hadrava, P. (2012). "Literary and cultural tradition of the Ptolemaic constellations." In: Ennio Badolati (Editor). Proceedings of the Third Conference on Cultural Astronomy. (Pages 87-99). (University of Molise, Campobasso. ISBN 978-88-67350-28-5). Hadravov, A. and Hadrava, P. (2012). "Ancient Greek tradition in Arabic and Christian celestial globes." In: Ennio Badolati (Editor). Proceedings of the Third Conference on Cultural Astronomy. (Pages 77-85). (University of Molise, Campobasso. ISBN 978-88-67350-28-5). Hadravov, A. and Hadrava, P. (2012). "On the Astronomical Collection of the Premyslid Royal Court 1. The Celestial Globe now in Bernkastel-Kues." In: Johannes von Gmunden (c. 1385-1442): Zwischen Astronomie und Astrologie. Hrsg. von Rudolf Simek und Manuela Klein. (Pages 111-121). (Studia Medievalia Septentrionalia 22) = SMS 22. Wien, Fassbaender. ISBN: 978-3-902575-47-0. Hadravov, A. and Hadrava, P. (2012). "On the Astronomical Collection of the Premyslid Royal Court 2. A Digital Facsimile of the Bernkastel-Kues Celestial Globe." In: Johannes von Gmunden (c. 1385-1442): Zwischen Astronomie und Astrologie. Hrsg. von Rudolf Simek und Manuela Klein. (Pages 123-130). (Studia Medievalia Septentrionalia 22) = SMS 22. Wien, Fassbaender. ISBN: 978-3-902575-47-0. Hadravová, Alena. and Hadrava, Petr. (2013). Catalogues of Stars and Premyslid Celestial Globe. [Note: Czech-language publication on the Premyslid celestial globe. Part of the Czech-language series, Sphaera octava. Myths and Science on Stars IV, published by Praha, Artefactum – Academia. 437 Pages. English-language abstract: "The Premyslid celestial globe (saved now in Bernkastel-Kues) is supposed to be a part of a collection of astronomical instruments and manuscripts of Czech Kings Premysl Ottakar II or Wenceslas II in the 13th century. Results of an interdisciplinary cooperation of classical philologist and astrophysicist show, that the origin of the unique instrument could be connected with the environment of the Hohenstaufen court of Frederick II on Sicily. The globe is the oldest preserved celestial globe of Christian Europe. It continues directly in the ancient tradition and it is constructed with an extraordinary precision according to Ptolemy's coordinates of stars and his prescriptions on globe making. The volume is completed with an edition and Czech translation of Latin version of al-Sufi's Catalogue of Fixed Stars (ms. Prague, Strahov DA II 13), in which the Ptolemy's catalogue was known to the medieval science." A 30 centimetre fragment of a dark marble celestial globe (Inventory number Sk 1050 A) is displayed in the Neue (Neues/Neuen) Museum in Berlin (on Berlin's Museum Island). The Museum currently dates Sk 1050 A to the Roman imperial period, 1st-century CE. Dr. Ulrich Kühne, in his recently (2011) published analysis of the fragment, concludes that the fragment dates to the Hellenistic period, 3rd-century BCE. The Berlin Celestial Globe fragment was purchased in 1889 by the Antikensammlung Berlin (Berlin antiquities collection) from unknown provenance and given the inventory number SK1050A. It was briefly discussed by George Thiele in his book Antike Himmelsbilder (1898). Georg Thiele’s lengthy paragraph about the fragment, a combination of facts and interpretation, has only recently been disputed. The celestial globe of which it was a part formed part of a water-clock. The fragment is discussed in the journal Der Globusfreund, Issues 45-46, 1998. 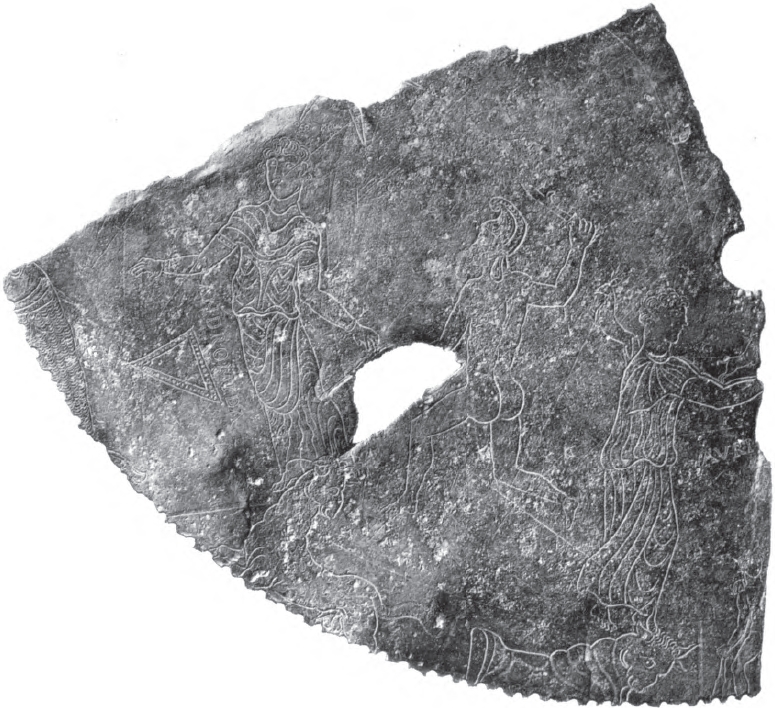 The fragment is described in Jahrbuch der Berliner Museen, 50. Band, 2008, termed Himmelglobus Sk 1050 A. 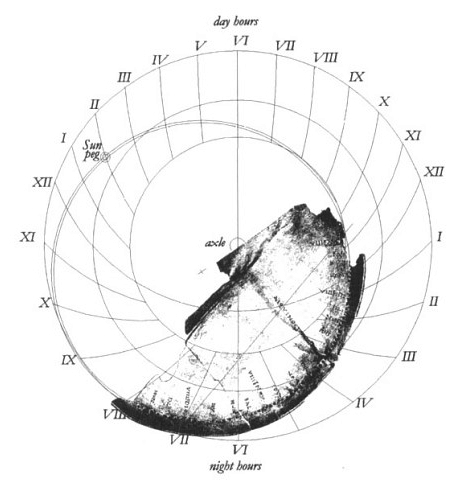 It has been recently (2011) analysed and discussed by Dr. Ulrich Kühne ("Evidence for a new interpretation of the Berlin Celestial Globe fragment SK1050A" (preprint http://philsci-archive.pitt.edu/8814/)), who disputes Thiele's conclusions. Thiele (1898) thought the fragment Sk 1050 A was part of an ancient vessel arbitrarily decorated with astronomical ornaments. Ulrich Kühne believes the evidence shows the fragment was actually part of a sophisticated astronomical instrument. According to Kühne the following constellations are indicated on the fragment: Milky Way, Hercules, Lyra, Cygnus, and Cepheus (instead of Cassiopeia, the standard interpretation). According to Kühne (based on the Abstract for his paper): Since Thiele (1898) the fragment SK1050A in the Neue Museum in Berlin has been interpreted as being part of an ancient vessel garnished with arbitrary astronomical ornaments. The evidence indicates: (1) Structures of the fragment indicate that the Berlin Celestial Globe was fitted with a water-clock similar to the design by Ctesibius (flourished 285–222 BCE, a Greek engineer, inventor, and mathematician in Alexandria, Ptolemaic Egypt) and that this water-clock propelled an astronomical model of the universe. (2) Iconographic parallels between Sk 1050 A and the Atlas Farnese suggest that the latter was intended to be a replica of the Berlin Celestial Globe (but the maker of the Atlas Farnese had only the fragment Sk 1050 A to work with). (3) The arrangement of the 16 'star-markings' on Sk 1050 A might be explained as geometrical constructions to establish spherical coordinate transformations. Accordingly, Sk 1050 A appears to be a sophisticated astronomical instrument designed by an ancient astronomer. The Grand fragment (drawn as darker section, illustration from Hoffman sale catalogue of 1886). Fragments of zodiacal disks dating from the 1st- to the 3rd-century CE (probably 1st or 2nd centuries CE) have been found at Salzburg (Austria) and Grand (France). The fragment from Salzburg, housed in the Museum Caralino Augustum, Salzburg, is made of bronze. The Salzburg fragment (dated to 2nd-century CE) originally formed part of an anaphoric clock (or parts of anaphoric clocks); a very sophisticated kind of water clock imitating the "risings" of the constellations. Analysis of both the fragments confirms that the zodiacal circles were positioned by means of stereographic projection; which dates at least to Ptolemy and may date back to Hipparchus. Stereographic projection is also the basic principle of the astrolabe. The fragment at Salzburg formed part of a Medieval clock (orrery). The fragment found in Grand (near Neufchâteau, in the Vosges) in northeastern France also formed part of an anaphoric clock. The 2 fragments of both later Roman period anaphoric clocks were found in the 19th-century. Because they were found in relatively remote parts of the (late) Roman empire it is likely the anaphoric clock was widely diffused in the ancient world. They comprise strong evidence that a number of Roman municipalities had these facilities. The Salzburg fragment was originally about 120-170 cm (estimates vary) in diameter. The fragment from Grand is only 35 cm across and much more crudely made. 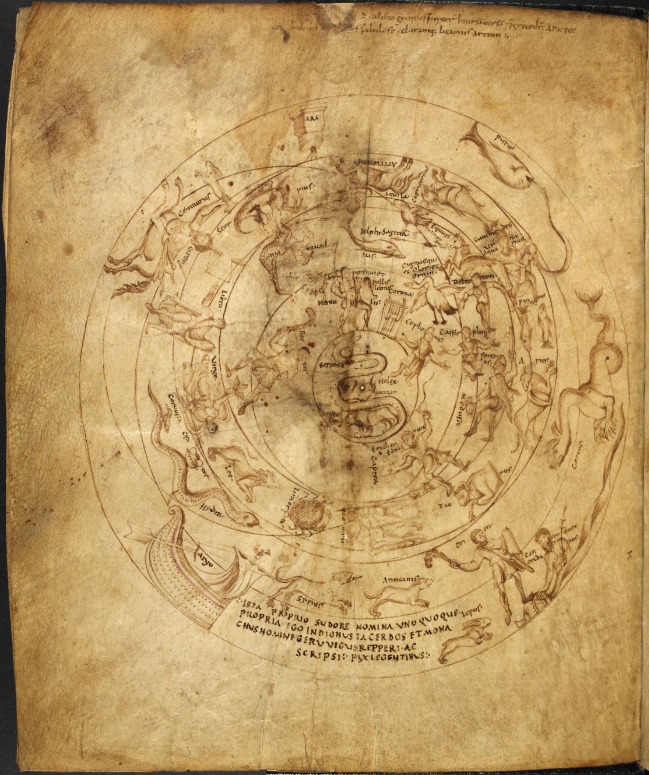 'Planisphere of Geruvigus' in Harley MS 647. (Photo Credit: British Library. Reproduced as 'fair use' for the purposes of education, criticism and comment.) The constellation illustrations reflect the Aratean forms. The earliest manuscript map of the sky is the so-called Planisphere of Geruvigus dating to the 2nd-century CE. It was included in a Roman manuscript version of Aratus' Phainomena. The manuscript has a copy of a famous illustrated poem, the 'Aratea,' on the constellations and planets. It included a representation of all the constellations in the form of a planisphere, so that their relative positions could be examined; names of the constellations were supplied by the monk/scribe Geruvigus, who is otherwise unknown (fol. 21v; see Fig. It shows only the constellation figures and these are depicted as seen from the inside of the celestial sphere. It is the oldest surviving exemplar of Cicero's Latin translation of Aratus' (circa 315-240 BCE) Phaenomena. It was made in France, probably in Rheims, about 820-840 CE. (Geruvigus was the first Christian monk possessor of the MS.) The manuscript is known to have been at St Augustine's monastery (a Benedictine abbey), in Canterbury (England), by the end of the 10th-century CE. The last page of the manuscript shows a copy of the 'planisphere' of Geruvigus, showing the positions of the constellations in the band of the zodiac which was believed to encircle all the planets in a perfect sphere. The MS included a representation of all the Aratean constellations in the form of a planisphere so that their relative positions could be examined. It is now in the British Museum. British Museum details are: Shelfmark: Harley MS 647; Item number: f.21v; Length: 32 centimetres; Width: 27.5 centimetres; Genre: Illuminated manuscript; Languages: Latin; Materials: Parchment codex; Foliation: ff. v + 21 (4 unfoliated flyleaves are parchment and 1 is a modern paper leaf). First folio is missing; Script: Caroline minuscule; Binding: Post-1600. Green leather with patterned tooling; marbled end-papers; Provenance: Corrected and repaired by scribe Geruvigus; inscribed 'Ista proprio sudore nomina uno quoque propria. Ego indignus sacerdos et monachus nomine Geruvigus repperi ac scripsi. Pax legentibus' (f. 21v). Other British Museum record details for Harley MS 647: Author: Marcus Tullius Cicero; Title: Aratea, with extracts from Hyginus's Astronomica in the constellation figures; Origin: France, N. (diocese of Reims); Date: 9th century; Language: Latin; Script: Caroline minuscule; Decoration: 22 full-page representations of the constellations in colours, often with text or scholia within the shapes (ff. 2v-6, 7-13v). Full-page diagram of the constellations in brown ink (f. 21v). Large diagram of the solar system in brown and red (f. 19). Small initials in brown or red. Text in red or blue; Dimensions in mm: 320 x 280 (various); Official foliation: ff. 21 ( + 2 unfoliated parchment and 1 paper leaves at the beginning and 2 parchment leaves at the end); Form: Parchment codex; Provenance: f. 1 is a slightly later addition (c. 1000, England. The Harley Collection was formed by Robert Harley (b. 1661, d. 1724), 1st earl of Oxford and Mortimer, politician, and Edward Harley (b. 1689, d. 1741), 2nd earl of Oxford and Mortimer, book collector and patron of the arts. Roman period zodiac (celestial) globe. Source: Il Museo Pio-Clementino II Giandomenico Spinola Guide Cataloghi dei Musei Vaticani, 4 Musei Vaticani Città del Vaticano 1999. Large (celestial) sphere spanned by the band of the zodiac, with images of the 12 zodiacal signs. Circa 1st- or 2nd-century CE. Marble, 60 centimetres diameter. The stars are randomly scattered over the surface of the sphere. Location: inv. 784, Sala dei Busti, Musei Vaticani, Vatican City, Rome. Roman period zodiac (celestial) globe. (Small (celestial) sphere spanned by the band of the zodiac (zodiacal signs).) Circa 1st- or 2nd-century CE. Marble, 16 cm diameter. Location: Landesmuseum Württemberg, Stuttgart, Germany. An early precedent for the modern domed planetarium was apparently the Roman Emperor Nero's 'planetarium'/rotating dining room. However, whether it was a reality or a myth still seems undecided. A report on a 2016 Nero exhibition in Germany made the claim that the octogonal dining room (having 8 sides and 8 angles) - coenatio principalis - of his palace Domus Aurea (Latin for Golden House) in Rome had either one rotating dome or several nested ones in order to display celestial motions. Or - since there is no archaeological evidence for such mechanisms - that there was a fixed dome with moving lanterns instead. (The Domus Aurea was a 3-floor villa complex built in the few years between the Great Fire of Rome in 64 CE and Nero's suicide in 68 CE. It was rediscovered early in the 20th-century.) According to Christopher Dewdney (2004), inside the the dome ceiling of the coenatis, the Roman radical/audacious architects Severus (Lucius Septimius Severus, architect/designer) and Celer (Petronius Celer, machinator or engineer) built a series of nested semispherical rotating domes (the mechanism being cranked by slaves) that simulated the movement of the planets across the night sky. Also, according to the Roman historian Suetonius (Gaius Suetonius Tranquillus (70 CE - 130 CE)): "The main chamber was round and revolved continually day and night, as does the world." Engineers also incorporated a network of metal tubing into the mobile domes so that the effect of rain could be reproduced from the artificial sky. In 2009, archaeologists thought they could show the floor would have been able to rotate, if not the domes, ceilings or lanterns mentioned. If the dome or ceiling was fixed, but the floor rotated, the end result would have been somewhat similar. The only contemporary source seems to be one line in a text by Gaius Suetonius Tranquillus. Scholars have long debated whether this planetarium-like aspect of the room was a marvel of Roman engineering or simply a figment of Suetonius' often whimsical imagination. Because nothing in the room indicates the former presence of rotating apparatus - at least until very recently - some have suggested that there was a lantern with constellations illustrated on the underside, and that this lantern rotated on wheels or rollers. Nero's Rotating Dining Room (https://news.cnrs.fr/videos/neros-rotating-dining-room; 08.19.2016) ""The main dining table, which was round, rotated night and day, imitating the motions of the globe." The surprising construction mentioned by Suetonius in his biography of Nero [Nero 31.2] has been found. On Palatine Hill (Rome), a Franco-Italian team of archaeologists discovered remains of a mechanism that could have allowed the rotation of the floor of the main dining room [banqueting room] of the Domus Aurea - Nero's vast imperial palace." An even better 'planetarium' is believed to have existed in Domitian's private palace, Domus Augustana, built in 80 CE high on the Palatine hill. It comprised a huge hall (measuring 87 feet high (26.5 metres) by 99 feet wide (30.2 metres)), called the Coenatio Jovis (Dining Hall of Jupiter) had glowing stars inserted into the overhead rotating domes. The simulated sky was described by the poet Publius Papinius Statius (circa 45 – circa 96 CE) - who had visited the dining hall - in his Silvae (a collection of Latin poetry). See the discussion on planetariums in: Acquainted with the Night: A Celebration of the Dark Hours by Christopher Dewdney (2004). This Web Page was last updated on: Wednesday, February 27, 2019, 2:00 am.